Create tangents from a coordinate to an existing arc, circle or ellipseentity with this tool. Use the mouse to specify the location of the start point of the line or enter a coordinate in the command line. Click the entity to which you want to create the tangent. Usually, two tangents are possible. When moving the mouse around, you can see a preview of the tangent that will be created. 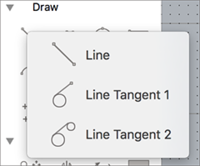 Create tangents from one existing arc or circle entity to another one withthis tool. Click the first arc or circle entity to which you want to create the tangent. Click the second arc or circle entity to which you want to create the tangent. Usually, four tangents are possible. When moving the mouse around, you can see a preview of the tangent that will be created.